Pardo 43 has been a great success: more than thirty boats have been sold in less than one year. 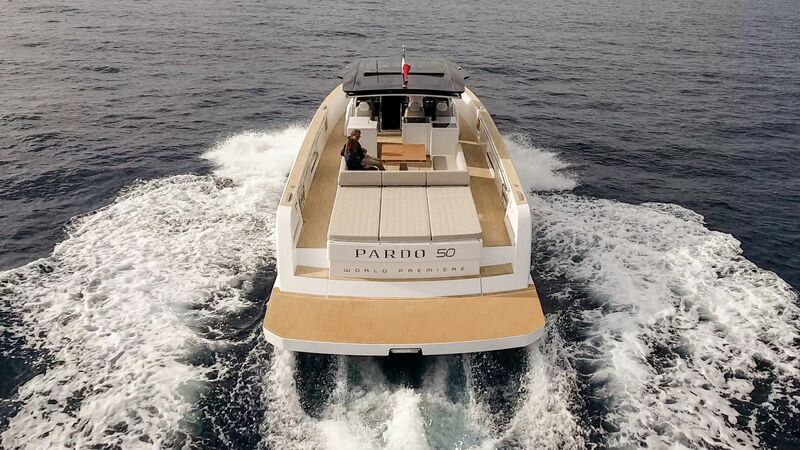 Now Pardo Yachts is proud to announce its second model, the Pardo 50, which was displayed at the Cannes Yachting Festival 2018 for the first time as World Premiere. 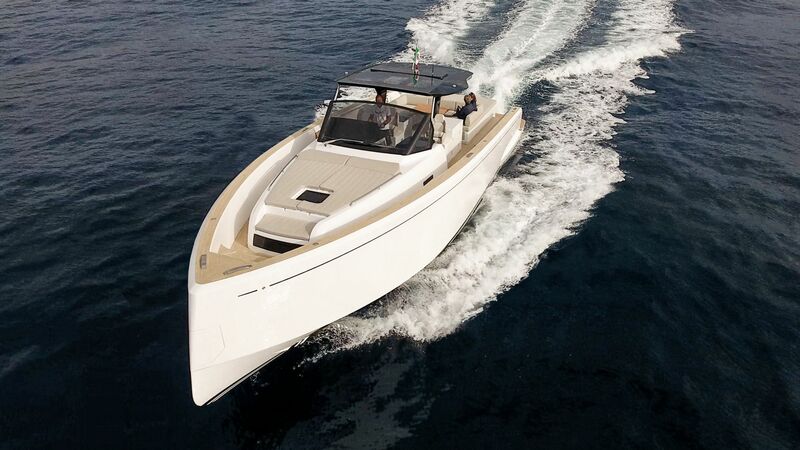 The new brand by Cantiere del Pardo, dedicated to powerboats, has launched this 16- meter walkaround boat on the market establishing Pardo Yachts as the new brand leader of the Made in Italy. Since 1973, the year of Cantiere del Pardo foundation, the shipyard has been one of the most prestigious companies in the boat building. With more than 4.000 high performance, quality and comfort sailing boats produced under the name of Grand Soleil Yachts, Pardo Yachts is now a synonym of power and elegance, comfort and functionality as well as personalization. 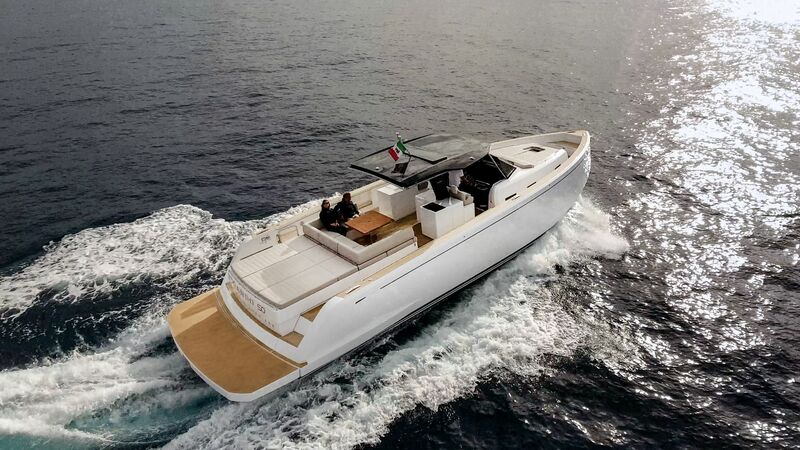 The strong relationship between Cantiere del Pardo and Pardo Yachts is remarkable in some details where two pillars (the sailing one and the powerboat one) have in common: for example, the radius surfaces on the deck recalls the one used in sailing boats and gives value to the neat-design hull. 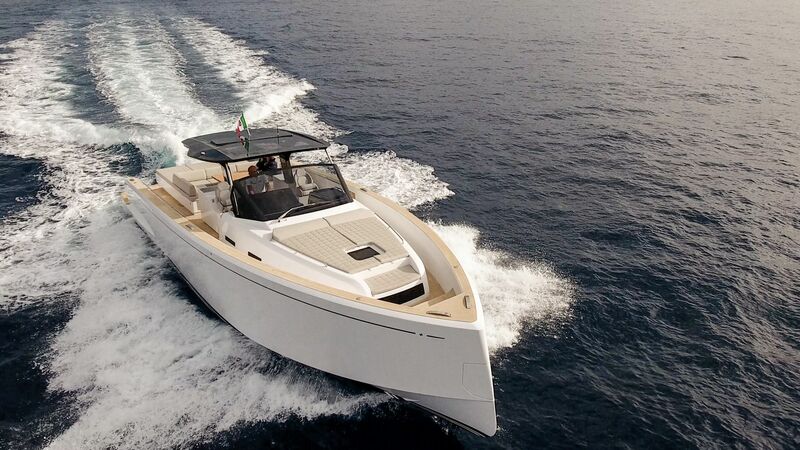 Same as the 43-feet little sister, Pardo 50 has been designed by Zuccheri Yacht Design, together with the Technical Dept. of Cantiere del Pardo. It has been created for a sophisticated owner, appreciating high quality, top design, luxury and comfort combined with performance and speed. 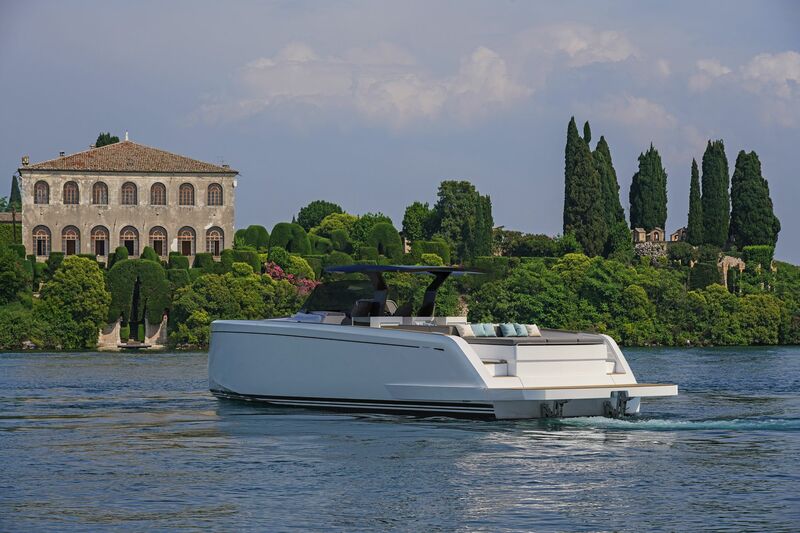 Thanks to the passion and the success brought by Pardo 43, Cantiere del Pardo further invested into technology and innovation which led to the new Pardo 50 project, where the hull shape, design and engineering have been carefully studied. The Pardo 50 is a perfect compromise between performance and comfort. Its V-shaped hull has a variable geometry: 16° at stern and more than 50° in the forward section. This guarantees a great seakeeping and at the same time good maneuverability allowing planning in safe and fast conditions. The convex bottoms ensure a greater shape stability. The engines are moved more ahead, to have a better center of gravity and greater stability. The standard version comes with 2 Volvo IPS 600 engines (700 or 800 are optional). The wheelhouse is equipped with joystick for the easier maneuvering and electronic thrust levers. Such installation of the engines keeps the bow from rising up allowing for nice and comfortable cruise. Moreover, it eases and accelerates the initial phase of the plane, ensuring a good and constant seakeeping even at the highest speeds. The Pardo 50 is perfect for those who love spending time with their family and guests on board as well as those who want to relax in a less crowded atmosphere. For this reason, one of the main characteristics of the deck is the truly comfortable walk-around, developed on a unique surface, from bow to stern. The high freeboard provides greater safety when having children or guests on board. Among the optional features, there is also the possibility to install a hydraulic swimming platform usually used on superyachts, in order to have a safe and comfortable access to sea. 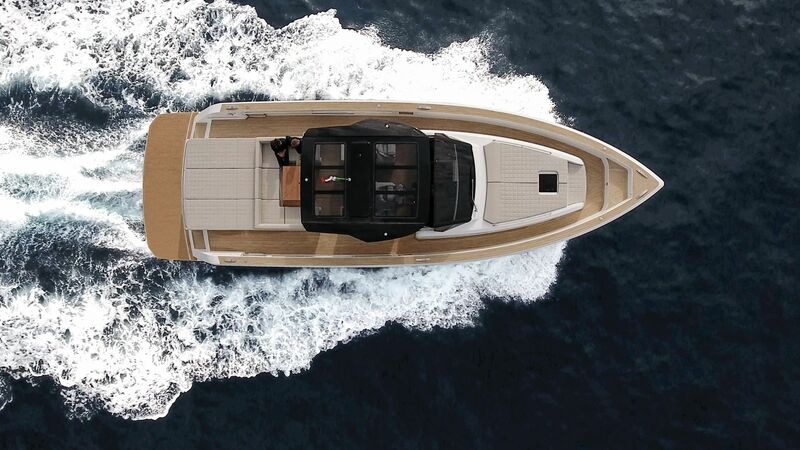 The stern of the boat can enhance the fun and the relaxation at sea: the movable side sections can be transformed into two big platforms – looking like two roofs on the sea. Thanks to that, the cockpit area can be significantly wider. The flooring is made of natural teak – provided as standard. Upon request, it can be replaced with synthetic teak. The cushions colors and upholstery can be fully customized by the owner. 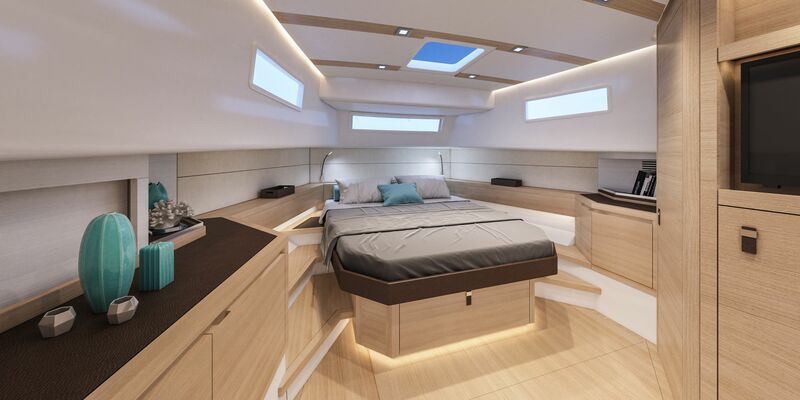 The relaxation areas are set in the front, where you can find a sunbathing area, and at stern, where you can find a wide sunbathing bed with a nice and big storage area underneath. That can be set up as a tender garage as well where a tender up to 2.9m can be stored. The 16-square meter fixed T-top is made of a rigid and light carbon fiber and it goes from the cockpit to the dining area. The covering can be extended to the stern with a extendable bimini that can be installed with an electrical mechanism integrated to the upper part of the T-top or with a manual system with poles. In the night, an external lighting system is provided to enjoy the romantic atmosphere in the whole cockpit area. 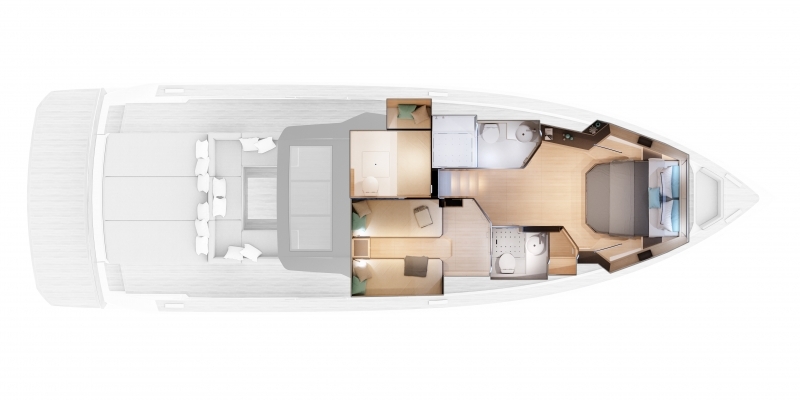 The interior plan is unique and of the the key selling points of Pardo brand: on the Pardo 50 you can find a wide open space with two cabins and two heads. 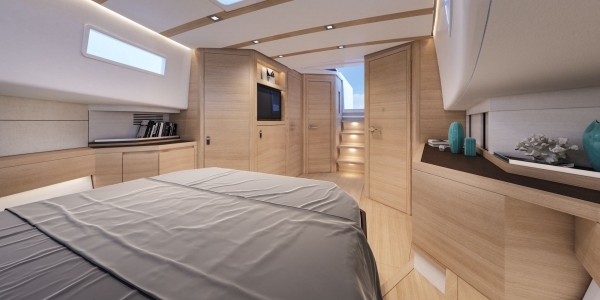 There is also the possibility to install a skipper cabin/third cabin, which is the main feature of this model. 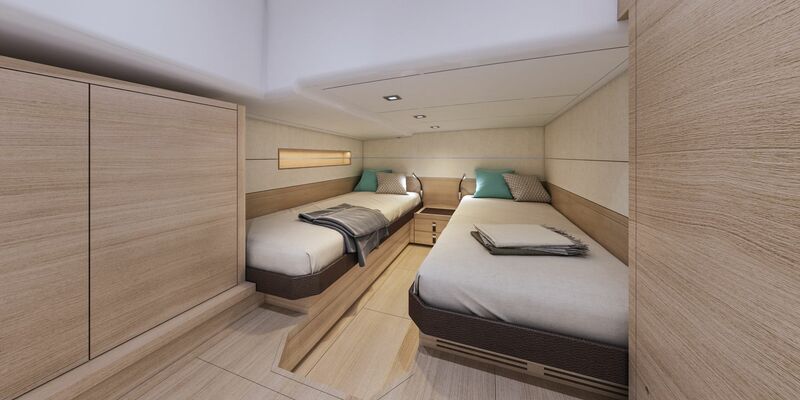 But not only, as optional there is also the possibility to installing a partition between the two bathrooms to create a real owner’s suite for maximum privacy on board. The interiors, with great heights, are the core of the shipyard’s DNA: a timeless elegance tailor made by the hands of expert artisans. The lines and the refined furniture are enhanced by the accurate choice of woods and the attention to details that make Pardo 50 a real excellence of the Made in Italy. The volumes of the owner cabin are significant: there is a double bed with a storage under the mattress, a full height wardrobe and a head with separated shower box, along with several storage areas. In the guest cabin you can find many lockers and drawers, two single beds and a head with an integrated shower. Two entrances are provided: one from the cabin and one from the corridor to be used as day head. All the colors and materials can be customized according to the owner’s wishes. Pardo 50 is a real unique icon in this powerboat segment. The advanced technologies on board are associated to the design, the elegance, the quality and the possibility of cusomization – features belonging to Cantiere del Pardo’s DNA.